As a freshman, James averaged 18 points per game. He helped the team to a Division III state title by scoring 25 points in the championship game. Word of his advanced basketball skills spread, and James received several honors for his performance. As a high school sophomore, he was chosen for the USA Today All-USA First Team. James was the first sophomore ever selected for this award. His team also won the Division III state title for the second year in a row. 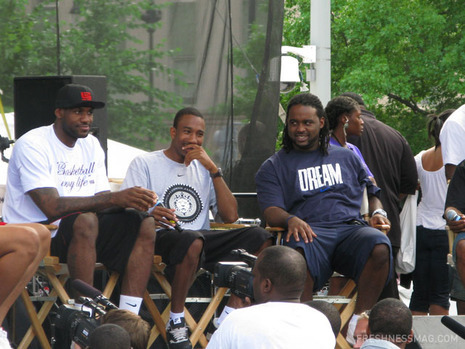 James was born on December 30, 1984 in Akron, Ohio, and attended St. Vincent–St. Mary High School in Akron, where he became a starter during his freshman year for the Fighting Irish. He averaged 21 points and 6.2 rebounds, and led the team to a 23–1 record, en route to the Division III state title. Keith Dambrot, now head coach at the University of Akron, was the head coach at St. Vincent–St. Mary. Coach Dambrot started working with James doing $1 clinics at a local recreation center. In his sophomore year, James averaged 25.2 points, 7.2 rebounds, 5.8 assists and 3.8 steals. He led the team to a 26–1 record and a Division III state title for the second straight season. He was the first sophomore to be named Ohio's "Mr. Basketball" and became the first sophomore ever selected to the USA Today All-USA First Team. In James' junior year his stats improved again. He averaged 29.0 points, 8.3 rebounds, 5.7 assists and 3.3 steals and was again named Mr. Basketball of Ohio. He earned a spot on the All-USA First Team, and was named the 2001–2002 boys' basketball Gatorade National Player of the Year. It was at this time that his nickname "King James" became a household staple in Ohio.